September 2012 Carlson Design drove from our shop in Tulsa, across the heartland, to install equipment in Iowa and then St. Cloud Minnesota. In St. Cloud, we met Marie Omann and her son Joe to install their new Plotter/Cutter. We started speaking with Marie months earlier about automating and over the summer we met her and Joe at a technology trade show in Fort Meyers Florida. Early in 2012 Marie noticed a growing demand in her custom cover business for ATV covers, Boat Covers, and upholstery at the local hospital. To meet this growing demand and to begin laying the foundation for transitioning her business from mother to son, Marie was looking for a system she could use to digitize her existing patters, begin working with CAD, and automate her pattern plotting and cutting. 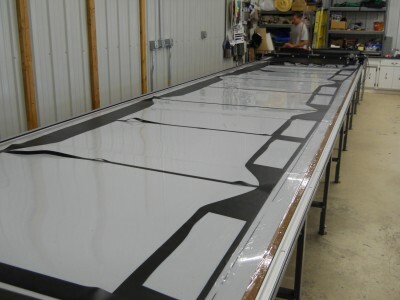 They chose the Classic Carlson Design CTx-72 Plotter/Cutter, T-Bar pattern digitizer, on a 6’x28′ long Phillocraft vacuum table. When Marie began her search for an automated cutter and pattern digitizer, she did not have any formal CAD or CNC experience. She knew another local shop used a 3D digitizer to pattern and then high-ply cut. However, for her shop, she wanted something that was easy to use, easy to change, and could quickly cut one off and repetitive patterns. During our meeting in Fort Meyers, we outlined a clear path to automation. Step 1: Digitize Existing Patterns with our manual 2D pattern digitizer. Joe digitizing! 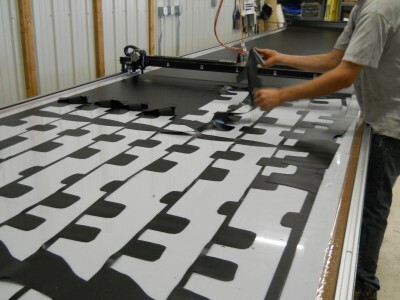 The T-Bar slides in the same track as the plotter/cutter, allowing the operator to manually trace patterns as large as the vacuum table. 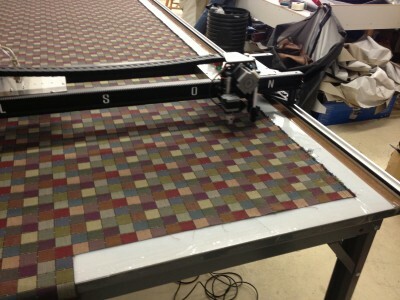 Using the our T-Bar digitizer, we started digitizing their existing patterns for a new large order and older recovers. During training we cut ATV cover parts Marie could immediately sew. 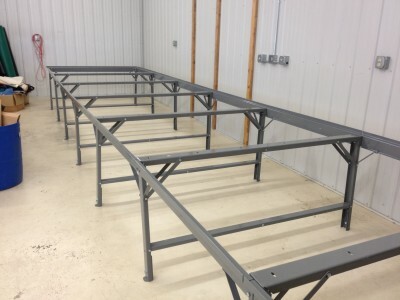 Step 2: Replace her existing home-made table with a seven section, steel frame, Phillocraft production vacuum table. 7 section frame before dropping in tops. Marie debated using her existing table wooden frame table. We also offered plans for her to build her own, new vacuum table. Joe is handy with wood, metal, electrical, and plumbing, so they weighed this option pretty seriously. Eventually, for the cost and time, they decided to get our vacuum table. Once setup, Marie exclaimed, “Wow, now THAT’S a nice table”. "Now THAT's a good looking table!" Step 3: Selecting a plotter/cutter. 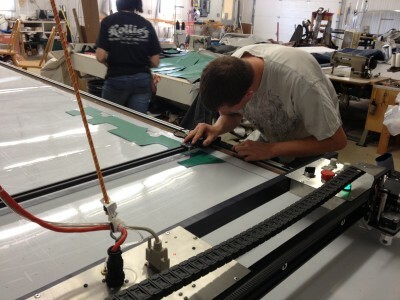 Marie is working with 54 and 61″ wide fabrics, so it was easy to select our standard 72″ wide cutting system. Looking at her current volume and planning for growth with Joe, well into the future, they selected our Classic CTx-72″ plotter/cutter. The Classic is ideal for cutting most woven fabrics including acrylics, as well as non-wovens like PVC. Step 4: Computer, installation, and training. Carlson Plotmaster Software Suite runs on most Windows XP or 7 PC. Having recently purchased a new laptop, Joe decided to load and configure his own PC. This allows him to pattern anywhere, and not just at the cutting table. Like the table, to expedite the “learning curve” and get cutting as soon as possible Marie asked us to come to St. Cloud and setup their system. 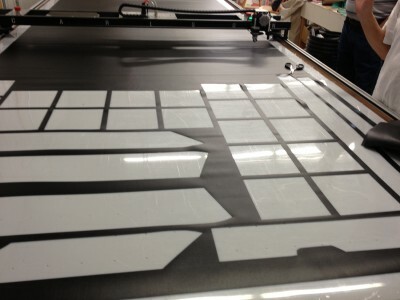 For the next two days we digitized full pattern sets, edited, nested, and then cut full tables. Full table nests! We cut 7 pattern sets in one hour. By hand this would have taken 5 hours or more! We had a great time working with Marie and Joe at Prodesign and we can’t wait to see how they use their Carlson to grow their business in the coming years!